During last year’s Oscars, you were in one of two camps; Team Big Hero 6 or Team How to Train Your Dragon 2. And that, of course, is putting aside those who were outraged that The Lego Movie wasn’t even nominated for the Best Animated Feature award. I was rooting for neither, as I am more of a Boxtrolls type of guy. Actually, I hadn’t even seen the HTTYD movies, and I really enjoyed BH6, so I guess I would have voted for that one by default. But anyway, there were a lot of people who were upset by the fact that their favorite animated movie of the year didn’t win the Academy Award. Now, having watched the series, I’m ready to take a stand. The first HTTYD would have received my support to win the Oscar over BH6. Actually, looking back, I would have chosen it to win over Toy Story 3 back in 2010, though I doubt that’s a popular opinion. But I can’t choose HTTYD2 over BH6 in 2014. It’s not quite as good as the original, and I think those who are shouting its praises are thinking a little too much about a movie that came out four years earlier. Spoiler alert! The Vikings made friends with the dragons. Berk is a new place, and the villagers are a new people, no longer fighting the dragons but befriending them and learning how to coexist with a species that is sensitive & loyal. 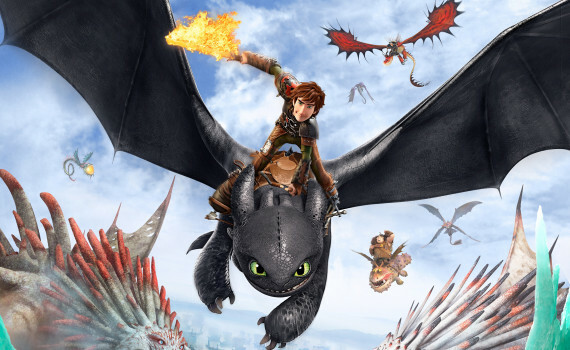 Hiccup and his dragon are the heroes of the land, connected with a special bond, and have made it their personal goal to chart the surrounding land, discover everything there is to know about dragons, and perfect the art of flying a ferocious friend. But all is not perfect and not everyone keeps dragons as pets. Hiccup discovers a band of poachers whose job is to capture dragons and take them to the evil Drago Bloodfist, a man who is creating a dragon army to help him conquer the entire land. Hiccup & his friends must stop Drago before he takes their dragons as well, a task that will be complicated by the surfacing of a strange dragon-tamer named Valka whose past will change the lives of the people of Berk forever. So much about the second movie is similar to the first; the dragons, the flying, the Vikings, the island, the battles. It even begins the same, looks the same, and uses some of the same plot points. Hiccup is a bit older, he’s solidified himself as a man of the village, but he still doesn’t know what his destiny is. Those who enjoyed the original should enjoy this one just the same, as it entertains in the same way and keeps almost all the voice overs as before. The few differences are what made me enjoy #2 just a bit less than #1. I understand that the humor has to appeal to both kids & adults, so I accept the sillier jokes that the original sometimes presented. But the sequel pushes across too many, especially with the secondary characters, and it quickly becomes annoying & distracting rather than helpful. And I really didn’t like Cate Blanchett’s character, though the visuals surrounding her were pretty spectacular. I just didn’t think she or her writers did a great job, giving the entire film a slightly less coherent feel. For my money, the original is better and deserves the credit for your enjoyment of the series, while the second one doesn’t quite stand up on its own. Still quality, still one of the best DreamWorks projects, still enjoyable, but not exactly perfection.